Our phones know a lot about us. We use our devices every day for years, and never pause to notice the patterns of interaction. 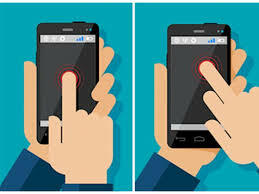 There are obvious markers of personality like: the ringtone, background, lock screen, if we have locked information or even how long our phone takes to lock up. What about the way we swipe the screen? It's kinda like a digital version of sitting in a chair. You naturally do it whatever way feels best to you, ands it's probably different than your neighbor. We have the top 5 ways people unlock their phone and what it means. Are you surprised your phone knew this much? The more you swipe right, the more understanding you are! Slow to open up to others, you have to feel connected or empowered. Once your fuse is lit, watch out, you are a creative and social hurricane! You are particular about your choices, knowing each one is a reflection of you. People view you as a well rounded, smart, capable and modest person. You attack everything with the same careful and nimble approach. As a result, you have a tendency of succeeding professionally and personally. Not terribly creative, you keep a fresh perspective and an open mind as you stride through life. You excel in the world of business, proving that you are practical, capable, and enduring. In your private life, you don't seem to have the same coordination. In relationships, you seem to constantly be playing catch up, but it's because you have so much passion! 'Nowhere to go but up,' is a fair summary of your tendencies. You are a positive person (even when you don't want to be), and can't stand to see anyone with a frown. Using that time tested charisma, you build and pepp talk anyone to where they need to be. All that energy and motion can wear you out, after all you aren't as invincible as you think you are. After a snack and a nap, you're back in the game! When you set out to get something done, you set out for the whole nine yards. The pride felt with every task accomplished, is a great and rewarding feeling. You have a tendency of overestimating your time and abilities. Often you find yourself holding a heaping plate of responsibilities. You choose this as it always keeps you busy and under stress. You feel you work best under stress. Don't wait until you hit burn out to take a breath my friend.